Continuum is a very long running massively multiplayer online game which has existed in various forms since 1995! It is a rather addictive multiplayer game with some cool-looking retro graphics, which reminds me a lot of Terraria, something that's come right back into style. Continuum features guns, bombs and large explosions in outer space. 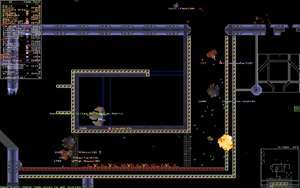 It is basically a spaceship/space-based shooter game. Version 0.40 is a freeware program which does not have restrictions and it's free so it doesn't cost anything. For security reasons, you should also check out the Continuum download at LO4D.com which includes virus and malware tests. Additional screenshots of this application download may be available, too.